Outposts and Trading - Take down enemy factions' outposts by defeating unique faction bosses with their own strengths, skills, and personalities. Participate in high-risk, high-reward trade runs through enemy territory. Refining and Crafting Bonuses - Each of the Royal Cities now has unique bonuses, based on materials that are rarer in that city's biome. Resource Redistribution - Enchanted resources now appear in greater quantities around the Royal Cities, providing new opportunities for gatherers and transporters. 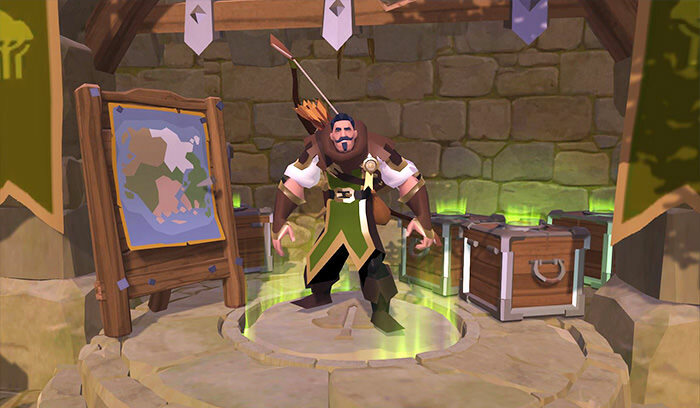 Equipment Overcharge - Overcharging an item gives it a temporary power boost, at the cost of risking breakage once the overcharge ends. Marketplace UI Improvements - In addition to a more streamlined UI, players can now view a more accurate average price display and an in-depth sales history. New Dungeon - The new T5 Group Dungeon, 'Stoneroot Caverns', pits you against hordes of massive Keepers in a sacred underground cave. New Costumes and Trophies - New wedding costumes celebrate the first year of Albion Online, and new Laborer Trophies are available for the various gathering nodes. Additional Improvements - Merlyn also brings balance and skill updates, easier navigation, bugfixes, and much more. For a more detailed list of everything coming with Merlyn, visit our update page.